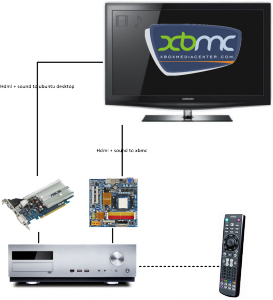 I’ve managed to get XBMC running (and good!). It took me a while to get everything to my liking. Almost everything works perfectly! Except sound is still a bit of a hassle. Linux (with pulseaudio) only sends analog sound through my s/pdif connection (aaarghh… forgot to draw in the schema ->) and not digital. Maybe I’ll switch back to alsa. But then again: maybe not. It’s only connected to an old Yamaha amplifier I had laying around so I don’t think I’ll hear the difference. I have a draft blog post in which I explain how I got everything running on Ubuntu 9.10. I’ll try and publish it as soon as I can :) And then I’ll update the schema too.